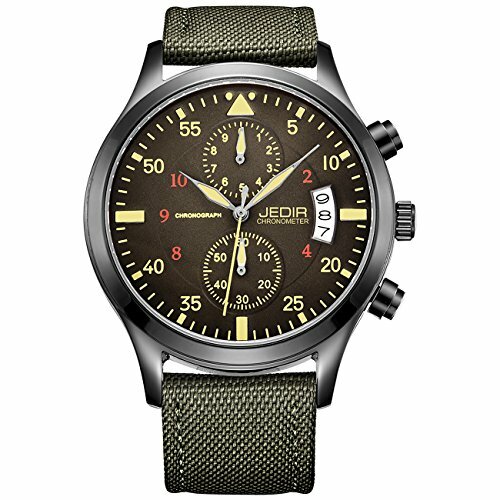 Check out this HOT deal on this JEDIR Men Military Chronograph Quartz Wrist Watch Analog Number Dial with Date Window Metal Case (Green) Priced at only $23.80 was $32.99. USE PROMO CODE 94T5BA96 FOR LOWER PRICE! Ships Free with Amazon Prime! HANDSOME AND FASHION: the strap made of army green canvas with black stainless steel buckle is easy to wear and looks cool; the casual design of yellow-brown dial and black case is more suitable for T-shirts and tracksuit. STRONG-VISUALIZED: mineral lens is scratch-resistant and has a good definition; the obviously difference in color of the time marks, hands and the dial makes it easy to read time; Arabic numerals with background display current date. WATER-RESISTANT: 30M; it is no problem when you wash hand, wear in rain day and sweating, not suitable for swimming or bathing and other underwater activities. MULTIFUNCTIONAL: 2 functional little sub-dials for chronograph microsecond, chronograph second; 3 rotary gear crown to Start/Pause, Adjust time/calender and Reset; it is a wonderful gift for men. PROTECTION: replacement with 30 days for any reason; 2 years warranty for quality issues.